The City of Cranbrook has planted 38 trees at Idlewild Lake Park this summer, with help from a $3,500 Community Regreening grant from BC Hydro. Pictured, left to right: Mark Krahn, BC Hydro Vegetation Maintenance Coordinator; Dee Williamson, Heather Gemmell, Mathew Pocock, Haley Rutten, Kelly Quinn and Sarah Wimmer, City of Cranbrook. Photo: BC Hydro. Cranbrook, BC (July 25, 2018) – Idlewild Park is growing shade with the addition of 38 new trees next to the rehabilitated lake. To help restore and retain green space in urban areas, BC Hydro is providing $3,500 for tree planting at Idlewild Park in the City of Cranbrook. As part of the Idlewild Dam replacement project, the City of Cranbrook partnered with the Columbia Outdoor School to create the Restore Joseph Creek project to restore the riparian area disturbed during construction. The work is to ensure the surrounding landscape at Idlewild is a healthy, functioning system capable of supporting the ecological and community infrastructure requirements while enhancing recreation, historic and cultural assets. The funding is through BC Hydro’s Community Regreening program. This year, BC Hydro is providing nearly $22,000 in support of six projects in the East Kootenay. 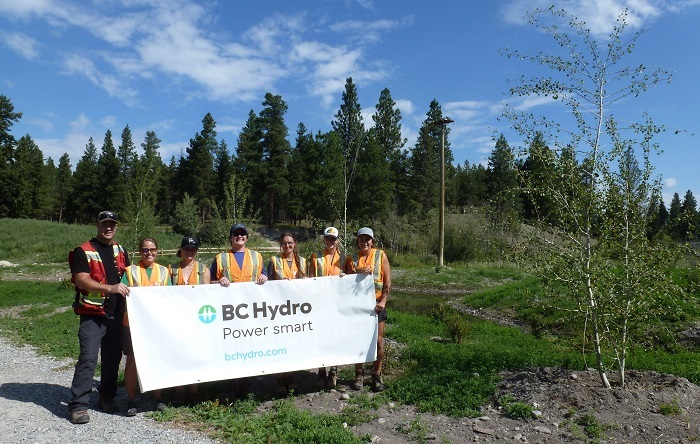 In association with Tree Canada, BC Hydro works with tree planting partners across British Columbia to help with the regreening efforts of municipalities, regional districts, and First Nations communities. The program is specifically designed to consider awareness and sensitivity to the proximity of power lines within each project plan. For more information on the Community Regreening Progam, visit www.bchydro.com/regreening.